ST Robotics has announced the addition of the new ST R17HS -- a high speed version of their five-axis vertically articulated R17 robot arm. The ST R17HS is one of the industry's fastest robots. The ST R17HS uses state-of-the-art brushless servomotors and boasts an effective reach of 750mm, a repeatability of 0.2 mm and a maximum speed after acceleration of 480 deg/sec in the robot's waist, elbow, hand and wrist, with a shoulder speed of 300 deg/sec. "The R17HS is the result of years of development that puts us ahead of the field," said David Sands, President and CEO of ST Robotics. "Customers are finding it useful for high throughput production as well as testing applications requiring fast motion of test devices." The R17HS robot arm comes with the new K11R controller, RoboForth II software, intuitive teach pad, simple interfacing with other equipment, cables, and manuals. 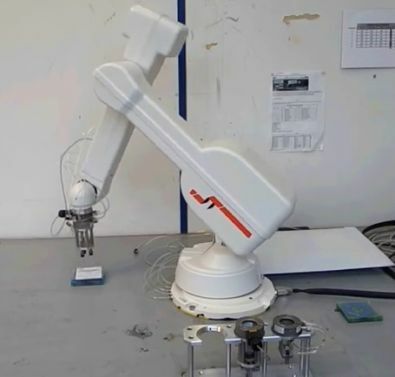 This robust, self-contained, industrial robot system can be unpacked and programmed in just a few hours, yet it is capable of the most intricate tasks. Applications include testing, sample handling and machine feeding. The mean time between failures (MTBF) is 10,000 hours and typically over a million cycles.